In an incredible move that has sent the online gambling world reeling, Skrill has been bought out by the company that owns Neteller. Big moves and business buy-outs happen all of the time in the online gambling world, but it's almost always one operator or software company absorbing another. In a bold move that's really making waves in the online casino world, the company that owns Neteller has purchased Skrill. This is a part of a massive £800 deal that has some serious ramifications for people who use Skrill. A lot of questions are going to have to be answered at some point. One issue that people have already is wondering what the fee schedule is going to be like if it changes. One of the advantages of Skrill is that it uses flat-rate fees for a lot of transactions, and if that changes, then it could alienate a lot of customers. What's more is that Neteller isn't exactly known for having a high level of customer service, but Skrill's customer service is satisfactory most of the time. The effects on customers is yet to be seen, but this buy-out is getting a lot of people nervous. What makes this move so interesting is that Skrill has made a ton of progress over the past few years by setting itself up to be a key competitor to industry giant Neteller. They changed their brand from MoneyBookers and pulled together a ton of deals to shoot up through the ranks as one of the top deposit and withdrawal options available in the industry today. Skrill was a sanctuary of sorts for players who wanted to play with an eWallet without having to deal with Neteller, and now that this has been taken away, it's anyone's guess what will happen next. 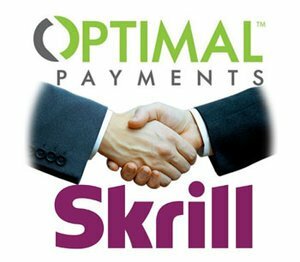 For now, it's looking like Optimal Payments is looking to go after PayPal as being one of the top online processing options in the world. While Skrill and Neteller have been primarily known for funding accounts in the online gambling world, they're also both seeing growth when it comes to other types of online transactions. This is the direct they seem to be heading in now after this merger.